Through his weekly columns in the Observer newspaper, journalist Nick Cohen chronicled the behaviour and the rightward swerves of Tony Blair's New Labour government better than most. Week in week out he would highlight the conservatism and the mendacity that was being played out before a distracted populace, raising all kinds of awkward and uncomfortable questions in a clear, intelligent and insightful manner. New Labour's great art was in media manipulation, the spinning of news, and of having all its main players 'on message' so as to present a complete vision. The trouble was that they were actually quite rubbish at it and it never took a lot to expose them. When Blair first entered 10 Downing Street, for example, jubilant crowds waving little Union Jack flags were shown lining the street cheering for their new leader. So there was Blair on television, smiling his smile and happily shaking hands as he was proffered bouquets of flowers in thanks for him finally freeing the country from Conservative rule. The problem, however, was that it was all staged. The crowds were all New Labour party members, issued with special passes to allow them entry beyond the Downing Street gates and then given little flags to wave. When Lady Di was killed, Blair appeared on television and gave his famous 'People's Princess' speech; the emotion and the sincerity dripping from him as he articulated the dismay of news reporters everywhere. Blair sounded as though he was talking from the heart, summarising an event and the impact of it that had still not properly sunk in. The problem - or rather, the truth - was that his little speech had actually been written by Alistair Campbell and Blair was simply delivering the words like a good actor. Prior to his election victory, a lot of people wanted to believe in Blair because in him they saw a light at the end of the 18 years of Conservative government rule tunnel. They were willing to forgive, forget, compromise and turn a blind eye just so long as it meant the Tories would be ousted. They wanted to believe that all the niggling doubts they had about him were misplaced and all the abandoning of Labour standards was simply a ploy to get elected and that once in power he would usher in a kind of post-modern socialist new age. It should be pointed out that at the same time there was also a significant number of people who didn't want to see Blair win because another Tory election victory might have led to much desired riots and revolutionary action on the streets of Britain. But that's a different story. For Nick Cohen, the first sign that all was not as it first appeared with New Labour was when he rang the then Shadow Home Secretary Jack Straw to ask of his views on zero tolerance tactics and as floated by President Clinton, the idea of curfews being placed upon teenagers out after dark. Cohen was somewhat taken aback by Straw's response which couldn't have been any less liberal. Firstly, Straw suggested that imposing martial law upon children who had committed no crime might actually be a good idea but secondly, Straw called Cohen back an hour after talking to him to ask if he could forget the conversation they'd just had because Straw hadn't been authorised to talk about curfews. As if an on the record interview might be censored by a politician. Cohen's final confirmation of all that he feared regarding New Labour was when Gordon Brown declared his party's commitment to stick to Conservative tax laws and spending targets, guaranteeing that however the electorate voted, conservatism would remain in power. "In effect," Cohen wrote "Brown announced that a permanent government of the Right had been installed without opposition and the hope of change." 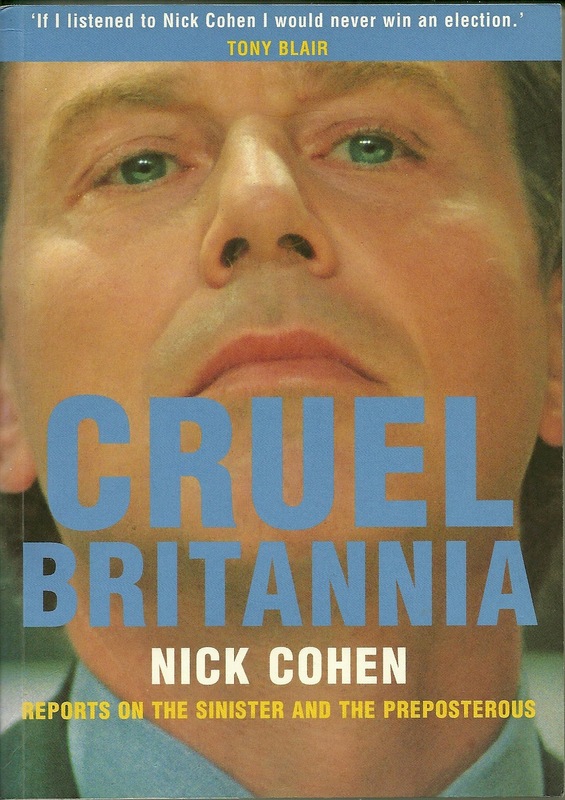 Cruel Britannia is a selection of Nick Cohen's writings taken mainly from the Observer but also including pieces from the New Statesman, the Independent on Sunday, and the London Review of Books. Reading his columns as a whole in book form reveals a consistency in New Labour's obsequiousness to the market that is almost fetishistic but at the same time it also reveals Cohen's consistency in lifting up the skirts of New Labour to reveal its dirty underwear, or often to even reveal that no underwear was being worn at all. He's like a dog with a bone that just won't let go though to Blair et al he was probably nothing more than an annoying gnat buzzing around that just wouldn't go away. If Cohen hadn't been alone and instead part of a swarm then maybe things wouldn't be the same today but alas he was but a voice in the wilderness so subsequently was easily contained. It's all water under the bridge now of course so what purpose Cruel Britannia serves these days, I'm not sure. Perhaps it's just to show that whilst different governments come and go - each successive one trying their hardest to tighten the screws and shore the ship up - the market remains permanently in place even if it's slowly sinking under the weight of its own suicidal tendencies? Or perhaps it shows that those wishing for a more radical and genuine change back in 1997 were right in wanting to see a Conservative election victory again so that riots, class war and revolutionary action might erupt on the streets? But as I said, that's a whole other story.